It's hard to avoid a "you're not in Kansas anymore" pun here--but according to Cake Gumshoe MJ, Laura Little's, a chocolate and confection shop in Prairie Village, Kansas, will have you wishing you were in the state immortalized by The Wizard of Oz. 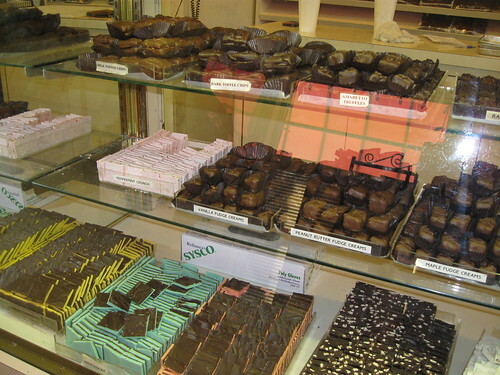 The shop, which is homey and sweet, offers a great variety of confections, including chocolates, fudge, brittles, pretzels, and toffees. But it's the fudge, says MJ, that is completely unbelievable. Just one look at their site reveals a tantalizing array of fudge, sold in thick slabs in flavors varying from vanilla and chocolate to more elaborate flavors like chocolate black walnut, chocolate cherry amaretto or penuche. And best of all, even if you're not in Kansas, you can order online and have it shipped anywhere. Though the state's motto may be "to the stars through difficulties", obtaining and enjoying this fudge seems easy as pie (of course, the store has even more goodies, so if you're in Prairie Village, you know where to go!). Laura Little's Candies, 2100 W. 75th St., Prairie Village, KS; online at lauralittlecandy.com.